Beef stew made in the slow cooker with chanterelle mushrooms for extra depth of flavor. MAKE THE MARINADE: Combine all the marinade ingredients, through the juniper berries, sea salt and pepper, in a large bowl. Place the beef in a large sealable plastic bag, then pour the marinade into the bag. Gently shake the beef around a bit to get it well-coated, then squeeze the air out of the bag and seal it tightly. Store the beef in the refrigerator for at least 6 hours or overnight. PREPARE THE STEW: When you’re ready to start cooking, place a strainer inside a large bowl. Pour the beef mixture into the strainer, using the bowl to capture and reserve the marinade. Remove the beef, scraping off big pieces of herbs and spices from the marinade. Set the beef aside in a bowl to cook. Heat the oil on medium heat in a large cast iron skillet. Add the chopped onion to the pan, cook for a few minutes until it starts to soften. Stir in the beef, combining it well with the onions. Salt to taste. Cook for 5 to 10 minutes, stirring occasionally to brown on all sides. After the beef has browned, transfer the beef and onions into the crockpot. Add the next “Additional Stew Ingredients”: carrots, parsnip, minced garlic, and reserved marinade to the crockpot. Make an herb bundle by using some kitchen string to tie together the sage leaves, thyme and bay leaf. Add the herb bundle to the slow cooker. Add the pinch of fennel seeds and sea salt to the slow cooker. Cook the stew with the slow cooker on high for an hour, then cook for an additional 8 hours in the slow cooker. Prepare the chanterelle mushrooms toward the end of cooking as described in the next step. When there are approximately 90 minutes left of slow cooking time, place the dried chanterelle mushrooms in a bowl and pour hot water of them. Let the mushrooms soak in the hot water for 30 minutes to reconstitute them. Place a damp paper towel inside a fine meshed sieve, with a bowl underneath the sieve to catch the liquid. Pour the mushrooms into the sieve, pushing down on them to squeeze out the liquid. Rinse the chanterelle mushrooms, the coarsely chop them. Add the mushrooms to the slowcooker along with 1/3 cup of the mushroom soaking liquid. The mushrooms should cook with the beef for at least 30 minutes. After the slow cooking time has ended, you can either serve the stew immediate, or you can reduce the liquid for a thicker stew. To reduce, transfer the stew to a large pot, and simmer uncovered on medium low heat for 30 to 60 minutes. 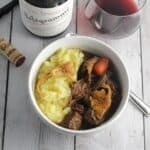 Serve the beef stew with mashed potatoes and a robust red wine.